Every so often I need to discover all over again that I run on music. My life has a soundtrack. The words and temperament of music affect me. This is good to know, even if I forget it from time to time. This most recent period of forgetting about music was brought on by a broken input to my car stereo. I can’t listen to my music in the car, and so I just got out of the habit of having music on at all. And incidentally I’ve been feeling a bit… stuck? bogged down? serious? slow? Something like that. So last night I scoured my iTunes collection for some of my favorite tunes – positive, powerful, grounded, light, earthy, driven, playful, deep, or funny. It might be the lyrics, or the beat, or something in the melody. Now I have about 6 hours of nutrition for my spirit. Like emotional vitamins. Good stuff! I went into the office for a few hours yesterday – something I hadn’t done yet this whole year, as I work off site now. It was a crisp, sunny fall afternoon, and was excited about seeing my friends there. A quick visit, checking out a new tool I’d be using on the cool project I’m working on, catching up with a few colleagues, and then I’d be heading to the dojo to assist in the kids’ class and train in the two evening classes. The makings of a pretty awesome day. I parked in the usual garage, on the 5th level, and headed for the stairs down to the street. When I saw them I was struck by something I hadn’t thought about in years. I stopped and stood there so long, just looking, that the security guard came over to see if everything was OK.
It’s funny the things that you forget. When I first started training I could not climb these stairs, not up or down. My knees couldn’t take it. Every day I had to detour and take the elevator. I could do a few steps. But whole flights of stairs, no. The pain behind my kneecaps just wouldn’t let me. It’s been so long ago, so much has changed, I’d forgotten it completely. There was so much wrong, back then. I had the knee pain, of course, and shoulder problems that had required surgery and ongoing PT. Plantar fasciitis meant I had to wear heavy hiking shoes with orthotics, and even with them I couldn’t walk far. Every morning I woke up stiff and sore, like I’d been sleeping on cold concrete. I had constant vertigo that felt like I was living aboard a ship, complete with seasickness during particular high seas. And neuropathic pain that would have sent me to the E.R. at times, except that I knew there’s nothing they could’ve done for it. I felt old and weak and broken. But I wanted become a better horseperson – more centered, less reactive – and I knew Aikido could help. I called and asked Sensei about classes that didn’t involve rolling or falling – I didn’t know if I’d be able to. “Nope. We all train together. 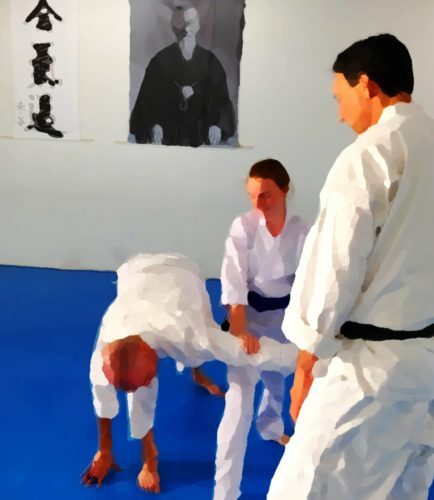 Come in, and just do what you can.” I didn’t even consider the link between Aikido and health – the possibility of actually improving one’s health. But I was cautiously optimistic, and buoyed by his confidence I decided to give it a try. I dragged my busted up self into the dojo and started training. When I first started training I loved this song for its powerful little flickers of hope and determination. I listened to it over and over, back then. I’d forgotten all about it, too. Shortly after I started training I injured my shoulder. It occurred to me I might have made a mistake, trying to take up a martial art at my age and with my collection of ailments. Soon after, it appeared that my neuropathy might be causing new and more dangerous autonomic nervous system problems. I was worried about what was wrong with me. I thought it might be MS. Whatever it was I was scared to death that it would get worse. But I’d already been drawn into Aikido – waking up in the mornings excited about getting to the dojo, smiling about nothing on the way home from class. Come what may I wasn’t going to give it up. It turns out the worrisome symptoms – near-fainting and seeming inability to regulate body temperature – had a perfectly harmless explanation. I don’t think my doctor has ever had a patient react with such relief and happiness to discover that she’s run headlong into menopause! But there weren’t only physical problems. In recently years I’d lost my sister to addiction, several friends suddenly to various health issues, and my first horse to colic. The equestrian community I’d been part of for years unraveled as members focused on recovering from a fire that affected thousands in our area. At the same time work went straight to hell, with a sadistic boss seemingly bent on ruining my career, and I had to quit that job. The 9/11 attacks and hurricane Katrina provided a fitting background. It was a painful time, and when I started training these things still had a strong hold on me. You know how years later you can clearly remember words that shocked your system? Someone says something so unexpected, so direct, so true that it pierces right through the usual listening we have for small-talk and ordinary communication. Like a time decades ago – maybe I was in my early 20s – in a supermarket… I was standing in the path of a woman’s cart and as I stepped aside I said “Oh, I’m sorry.” Instead of the usual “no problem” kind of civility she snapped at me sternly, but not without kindness, “Don’t apologize. Women are always apologizing. Don’t do that.” It came from out of the blue – a little verbal dope-slap – that it really caught my attention, and made me think. She was right. I took her advice to heart, and try to follow it to this day. Anyway…I was training one day, and I don’t know what I said – probably something about how that particular technique was really hard for me, you know, with my shoulders, or how badly I was doing it – when Sensei snapped at me in the same way, not out of meanness, but so direct and piercing that really caught my attention: “Stop wallowing in your own misery!” Whoa… I hadn’t realized it, but I really was. For sure I had some problems, but I was turning circumstances into misery; I was the one doing the wallowing. I hadn’t been aware of that. I took Sensei’s words to heart, trying to catch myself when I’m inclined to revert to that way of being. The world is a brighter place when you’re not wallowing in misery, it really is. When I started training I had no idea what a sensei was, really – what it would mean to have that kind of teacher in my life. Someone who not only points out where I need to correct my body, but where I need to correct my mind as well. Not only showing me where to put my feet, but where to put my attention. Sure, I figured that he knew what he was doing as far as technique, and could teach it well. I assumed I’d be challenged with faster, harder attacks as I became better able to handle them. I thought I’d learn to stay calm and deal more effectively with scary, painful reality. I didn’t hope circumstances would improve. I never imagined that I would be challenged to change my reality. I didn’t even know that was an option. I couldn’t see that far ahead. Now that old reality is only a distant, faded memory. It comes back to me, infrequently, in dream-like flashes – like when I’m stopped in my tracks at the sight of a stairwell, realizing I’m about to jog down 5 flights in light, flexible flats and a skirt, excited about the beautiful day ahead of me, like it’s the most natural, normal thing in the the world. And now it is. Thank you for that, Sensei. I’ve been applying Aikido off the mat lately, in a big way. Feeling what’s actually happening, instead of imposing my interpretations or expectations. Blending with circumstances instead of fighting them. Seeing things from others’ points of view – and seeing others as cooperative partners, not in opposition. Keeping my center and integrity, speaking clearly and directly. Finding a resolution that leaves everyone in a better place. I’d be kind of impressed with myself for being so clever, except that it’s simply an effect of my Aikido training that I can’t not-do these things. Oh, I did plenty of resisting and fumbling around first, but ultimately the Aikido came through. I’ll start with right now. So far this weekend has been absolutely wonderful. I am starting to decompress and breathe lately, and am getting caught up a little at a time. Yesterday (Friday) afternoon I got checked for new glasses, which I need for an upcoming trip; my eyes aren’t happy about contacts lately. Then I had a couple of hours before going to dinner with family visiting from out of town, so I was able to putter in the yard, watering the native plants I put in months ago. Dinner was relaxed, and we all sat and talked and enjoyed each others’ company. Afterward, Michael and I went for a walk along the beach boardwalk at Coronado. Before bed I did some planning for upcoming projects I’m excited about getting started. This morning I did a bit of writing on an idea that came to me while driving to the dojo. I’m getting over angry back muscles, so I just watched the first class and warmed up at the break. I was able to roll the length of the dojo and back, which was very encouraging. I participated in the second class – weapons. The 2nd-kyus and up had a great class on the first five kumi-jo, while the white belts went through the first 10 jo suburi. After class I picked up food at the little farmers market store across from the dojo, and drove home eating bar-b-que potato chips. Not the best nutritional choice, but man were they good! This afternoon Michael and I used the tractor to take out dozens of accumulated trashcans of donkey manure, and filled our 3-yard dumpster to the brim. Later, he headed east with a friend to do some astronomy out where the skies are dark and the air is clear, and I went to a friend’s house to celebrate her birthday. After coming home I picked up my guitar for the first time in many months, and discovered to my delight that not only can I still pretty much play the thing, but it’s easier than in the past because my arms and hands are stronger. I spent a few minutes watching our local mother raccoon and her babies eating on the back porch, and then I rinsed a huge handful of delicious cherries for a snack, and sat down to write this. And it’s still only Saturday. Bliss. I couldn’t see a way to dig myself out, nevermind getting into a position to pursue some of my own work that’s really important to me, including writing. As you may have noticed, or maybe you even stopped noticing by now, I haven’t been writing much. Only a few gasps, coming up for air from time to time. I paid attention to what I was feeling, and finally recognized what was so: I was exhausted, frustrated, and burned out. I realized I was in a situation that didn’t work for me. Seeing something clearly that way is like seeing a hidden image in a drawing – once you’ve noticed it, you can’t not see it; it’s right there. I was being pulled in too many directions. I wasn’t able to focus or do my best work. I wasn’t happy at all. Once I saw that, I stopped trying to deny it, minimize it, or hope it would go away. I also stopped trying to figure out what was wrong, or who was to blame. Those things just didn’t apply. The reality was what it was. I simply wanted to change how I was handling it. If you’re swimming as hard as you can against a strong current, and still not able to keep up, the answer isn’t to try to swim harder, it’s to get out of the middle of the river. I needed to make a serious change: Somehow not work so much. Focus on one project at a time. Have time and energy for my personal work. Communicating that is an interesting challenge, and a risky one, but it was a risk I had to take. It felt like an irimi, an entering blend. Get close, see your partner’s view of the world, find a positive resolution. I spoke honestly, from the heart, about what I needed, and suggested a solution. This week I am starting a new way of working: part-time, hourly, as needed. That means when there’s work, I can work, and when there’s a lull, I can focus on learning, writing, training, and finally getting some gardening done. I will be working almost exclusively off site, which I’m very happy about, since I do well with fewer distractions, a quiet office, and my stand-up (sometimes) desk. My Michael is being supportive, and is looking forward to some of the house and yard projects I have planned. My employer, to their credit, is willing to give this a try. In theory, it should work well all around. I can ease the workload during busy times, and not be a burden on the payroll during slow times. I’m taking a few weeks off, too. I’ll get caught up on some things, get started on others, and take an actual vacation with Michael – a two-week road trip to Portland to visit some friends. It’s been a long time since we’ve gone on a proper vacation and we’re both really looking forward to it. There is no way before training in Aikido that I would have found my way to this outcome. I would have denied the reality of the situation. I would assigned blame and felt victimized. I would have avoided conflict by leaving my job (which I really do enjoy – just in smaller amounts), instead of initiating difficult conversations about alternatives. I would have moved toward a “resolution” that really didn’t work well for anyone. Regular training in embodying these skills, feeling, aligning, blending, acting with clarity and directness, is what let me be who I need to be to have this happen. Tomorrow, Sunday, I get to sleep in. Eventually, we’re going to the Sea Chanty Festival at the San Diego Maritime Museum. I’ve been wanting to go for years, and somehow haven’t gotten around to it. On the way home I’m stopping by the office to clear out my desk, and leave it ready for a new hire who can now be in with the team. I’ll finally get my oil changed – another long-overdue chore. To top it off I have a massage in the evening. Joy! It was like a lighted match had been tossed into my soul. It was like a dam had broken in my heart. The lyric is about a song unexpectedly bringing back long-forgotten memories of someone. But these lines really capture for me the experience of discovering Aikido. Something clicked internally. Perhaps, like the song, it is a kind of remembering, too. Not memories of another, but of who I am. I’m going to try to keep this brief, because come hell or high water I am going to get 8 hours’ sleep tonight. The teacher tonight asked me (since I’ve been to a lot of classes this week) what techniques we had been working on in the classes. Or at least what kind of work we had been doing. I could only come up with a very short list. I really should start being more conscious of that, I suppose. So I’ll try to post a very brief summary of at least a few memorable points from each class, mostly to use for my own review. We also did a bit of open-hand jiyuwaza. A fairly large class, with a broad range of levels, learning happo giri looks a heck of lot like a big group of folks trying to learn a line dance. It went very smoothly, and none of us whacked each other. I couldn’t help but think of The Electric Slide (video on YouTube), though, as we all stepped and turned at the right angles, all together. A music video would be hilarious. The most recent exams at the dojo were last week. Exams come around every few months, with the next date being February 6th, 2010. I don’t know if I’ll be testing then (for 5th kyu), and I don’t care. But I am setting it as a personal goal for myself to be on track to test then. That means paying even more careful attention to the techniques that are on the test, training thoughtfully, etc. We each work with a senior student when preparing for an exam. It’s our responsibility to find a mentor, so I’ve been doing some watching and thinking about who I might want to work with some day. At least if my name does appear on the Dreaded Dojo Whiteboard, I’ll have an idea of who to ask. To be clear, my goal is not to test on February 6th. I am not even hoping to test then. That’s up to Sensei, of course, and I’m not in any hurry to “get there” anyway. The goal is to train as if I will be testing, regardless. OK… Off to bed. Two classes first thing in the morning. Right after my 8 hours of sleep. Several weeks ago I participated in the Aikido In Focus seminar called “Relax, it’s Aikido," one in a series of seminars by Dave Goldberg Sensei, Aikido of San Diego. In the last few days I’m finally finding my realizations from that experience forming themselves into coherent thoughts. OK, so I think slowly. I didn’t know what to expect from this seminar. Relaxation is something I knew I needed to work on in my riding, at least, and it was bound to be a pleasant enough experience, so I signed up. I regularly go to a 90-minute class, and the seminar was only 2 hours, so I wasn’t expecting miracles. But I knew immediately that something deeply important had happened to me in the seminar. The best I could do at the time was to see it as a mental image of hands lifting a stuck Roomba (a wandering robotic vacuum cleaner) out of a corner. Or perhaps more poetically, a little fish being helped from a tide pool into the open sea. (Funny that I think "kohai” sounds like it should be the name of a little fish.) There was a distinct sense of being set free from a tightly bounded existence, and having a vastly expanded space in which to live and play with others. I noticed friends laughing, and it made me happy. I seemed more receptive to the emotional states, both positive and negative, of people around me. Something happened, but I couldn’t say what it was. There’s very little of the visceral, experiential "doing" of Aikido that I can put to words. I think that’s why I end up writing poetry about a lot of it – because that’s evocative, not rational or explanatory. This is really challenging for me, because the way I get things into memory frequently is by writing them down. So I sometimes feel like have only the most tenuous hold on newly-gained knowledge until I have put it into my own words. And when friends have asked me what we covered in the seminar, the best I could do was to blabber incoherently that it was a lot of fun. I could say there were these really cool exercises we did, but I couldn’t even describe those in any context that would make sense. Don’t push so hard against the world. Even though you’re a Big Strong Girl? The seminar itself was great fun. Very pleasant and relaxing (as one might expect). We started with a sort of whole-body inventory – finding tension and letting it go, getting centered, breathing. When everyone was in a soft, relaxed space we moved on to doing lots of fun exercises, mostly interacting with each other. I could describe who did what, and how it all looked, but that would be beside the point. It’s telling that when I mention or think of the name of the seminar, I almost always get it wrong. I remember it as being about ”feeling“ – about letting yourself feel. Sensei created a safe, trustworthy environment in which to experience relinquishing control, and going with the feel of things. We got to experience responding naturally and effectively by feeling each others’ movement and energy, moment-by-moment, and not trying to decide ahead of time, by thinking, what we should be doing. The way I see it there are two ends to the spectrum that was revealed: A tense, forceful, controlled way of being versus being relaxed, open, and following the feel (an expression horsepeople will recognize). As you might have guessed by now, I tend to live on the controlled end. I know how things are supposed to be, and have some pretty good attachment to trying to make them be that way. That can be fine in some circumstances, like knowing and following traffic laws so nobody gets killed. But as a way of life it’s somewhat limiting. OK, it’s a lot limiting. Days after the seminar, still on a vague sort of indescribable high from the experience, I finally started to see that bigger picture, and it hit me hard: I haven’t been letting myself feel. I habitually operate from already knowing, and forcing, rather than from perceiving and allowing. In response to a lot of physical pain over many years I mostly stopped hearing what my body had to say. I like people, and am happy to interact with them, but I don’t let them affect me, really. My emotional dial only goes from 3 to 7. In shutting out grief and disappointment I’ve also shut out joy and passion. I haven’t been letting myself feel. And then there I was, suddenly in tears, realizing the cost of living like that, and seeing the potential in letting that go. I’ve never experienced that level of emotion from a… a what… Epiphany seems too strong, too cliche, but yeah, that’s really it. (”a sudden, intuitive perception of or insight into the reality or essential meaning of something, usually initiated by some simple, homely, or commonplace occurrence or experience.“) A sudden insight about who am, how I am, bought on by the simple experience of relaxing, and letting myself feel, and act on feeling for a couple of hours.